I am rose obsessed. In some way, shape or form, rose is in my daily routine. I even drink rose tea. 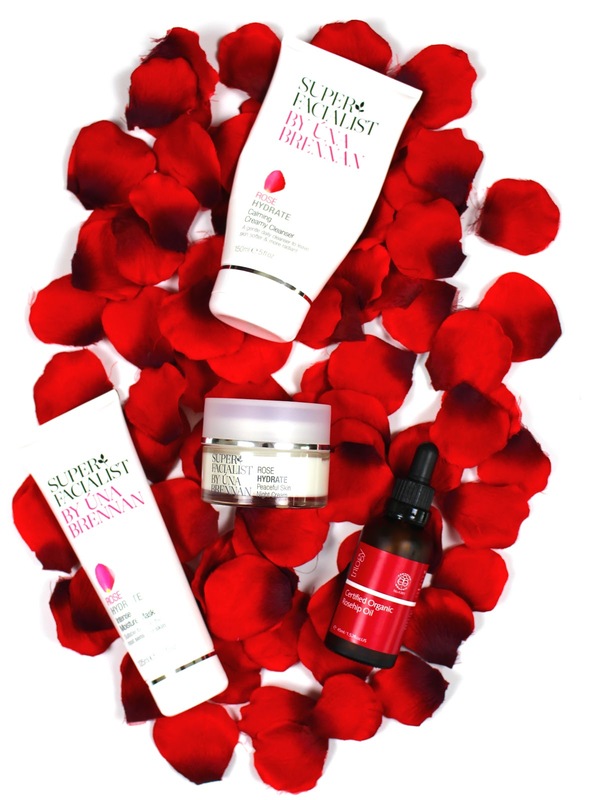 Today I wanted to share a group of products that make my life rosy. Quick disclaimer, I've unintentionally included a lot of Una Brennan skincare in the post for no other reason than I love it and use it everyday. You've probably heard me bang on about this cream cleanser countless times before. It's a really gentle cleanser that's ideal for the morning when you don't need anything too heavy. I've gone through several tubes of this stuff and still can't fault it. I adore this night time moisturiser because it's hydrating yet very light. It gets absorbed very quickly, doesn't leave a greasy film and has a lovely relaxing scent. I would say that this is more suited to the summer months when my skin doesn't need as much hydration. I think I'll need something a little more rich for the colder months. Rosehip Oil is my new thing. I love using it a few times a week to nourish and rehydrate my skin. It helps heal and fade scars and feels incredibly soothing. Trilogy's Rosehip Oil is brilliant because it's very light on the skin and is 100% organic. It's not cheap, but it's worth it. This is the newest to my collection and I've only just started testing it out. It's designed to be used once or twice a week to add hydration and plump the skin. I'm really intrigued by this mask as it seems to be very similar to the Origins Overnight Hydrating Mask without the hefty price tag. As I said, I've also been drinking rose tea. I usually add three dried rose buds to a mug of boiled water and let it steep for about 15 minutes. The taste is very light and fragrant. Rose tea is very cooling for the body and helps keep everything balanced. It takes a bit of getting used to as it is quite floral, but it's really delicious and calming. I love adding a bit of fresh mint and ginger if I'm feeling nauseous. Rose has pretty much taken over my life. It's great new addition and seems to be helping my skin and my health.